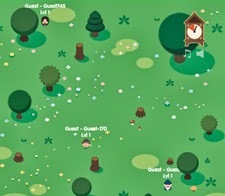 5 Minute MMORPG is a game developed during the Nordic Game Jam 2009, the biggest game jam in the world. I was one of the programmers on the team. The team consisted of about 10 people and had 48 hours to create the game. Because of the short time you have to create the game in this was a great exercise in rapid prototyping. The game is a fast-paced, action-packed, kind-of-but-not-really massively multiplayeronline role-playing game, played in the comfort of your own browser. It's everything you want from an MMORPG, in just five minutes. Over thirty playable characters. Level to 80, in less than five minutes! Tons of loot . Simulated lag! Control your avatar in the future!! Rich, detailed fantasy world, with procedurally-generated lore. My contribution as programmer during this project was to create functionalities such as attack and defend moves for the players, but I also helped creating the delay mechanism (to simulate the lag) which is one of the main game mechanics in the game. The game was developed using Actionscript 3.0 and Nonoba and is free to play.